A very sweet, cute, unique YA. I loved this one so much. I don't think I've ever read a book involved with online gaming. It reminds me of a lot that goes around in my own house. Katie I love. She wants to make changes so she is seen and no longer invisible. Which I could relate to from my own high school experience. She is sweet and in love with her best friend Alex. Now Alex is a bit of a player and adrenaline junky. He is still trying to heal from the death of his brother in many ways. I love how close Alex and Katie are. They are so cute together. It such a heartwarming read. I couldn't put this one down. You'll love Katie and Alex. This is a sweet book about bonding over loss, being oblivious to the obvious and of course video games. Katie is the shy nerdy girl who is best friends with a hot serial dater adrenaline junkie gamer Alex and how they have become one another's emotional support. This book touches on a variety of subjects but does it in a great story. This is an excellent feel good story. I never realized what goes on in the gaming world. This book was a really good peek in with a side of romance. Ugh, I'm so torn about the rating right now. I'm so in the middle of a two or a three, but I honestly don't know which one that it's leaning toward either. I'm going with a 2 for the moment, but it's was close to being up to a 3 - and I think the only thing stopping me was that I don't think it's going to be that memorable in the long run. That being said, this book had some super fun moments and was pretty adorable. It had a slow burn romance that kept me forever teetering in that sweet spot of will-they-won't-they miscommunication. I liked one of our main characters, Katie, a lot. I liked her voice. I got her. I thought she was a delightful character, and I thought she could definitely be a good friend. The other main character, Alex? Eh, meh. Idk, he was just kind of there. I really wasn't feeling him. I also really liked Lexi a lot! She was a really good friend, and her, Penny, and Trevor were a great gaming gang. I'm also a bit torn on the message that the book was sending either. I think Griffin did a pretty good job of subverting tropes at times, and not so good at the other times. Usually in contemporaries, there is a ton of girl hate since some are so focused on romance. For the most part, there wasn't any girl hate at all when Katie was competing against Lexi for Alex's love. There were a few times I saw it peak its ugly head, but it was mostly not there. As for the whole changing your image for a guy? I totally felt there was a good moral of just being yourself but I felt like Alex's voice kind of contradicted some of those messages - which made me not like reading his voice as much, I think. And I kind of felt that there wasn't enough of a message said at the end to really drive it through. However, I do love how gaming was celebrated in this novel - even though I don't like gaming myself. The ship was cute, although I totally think the true ship was missed, LOL. But it was cute. I could feel the feels, and they had me on the cusp of COME ON, LET'S GET TOGETHER BUT MAYBE NOT the entire time and I do love that edge. Griffin did it quite well. I love a good miscommunication to drag the ship out a bit more - it's where the feels are so real. However, I felt like they were just being so stupid at the end. There was WAY too much miscommunication for no point, and it just turned into a mess. It wasn't fun miscommunication anymore but just stupid and I just wanted it to get on with it. The writing was nice and easy, though. It was super easy to read and I sped through the book so easily. Definitely a nice, breezy summer contemporary read. Overall, I'm still a bit torn on the rating. I think there were some questionable things that left me wanting and expecting a bit more for this book. I think it just missed the potential it had to be great. However, there were some great parts including a good gaming game, a likeable main character, and easy, breezy writing. It has some good, but I'm not sure I would recommend if you're looking for something deeper. 2 crowns and a Cinderella rating. 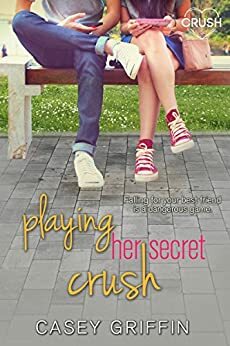 Playing Her Secret Crush by Casey Griffin is a cute contemporary romance in which best friends have hidden feelings for one another. The one thing it seems the book blurb has left out is the setting being based around professional gaming. Now that it’s their senior year Katie thinks she needs to break out of her shell and quit being the shy, quiet girl that others don’t notice. Katie and Alex have been best friends for the last few years but crushing on Alex has gotten her no where so she vowed to make some changes. Alex has always had his own secret crush for Katie but Alex believed his older brother had feelings for her before he passed from cancer so Katie is the one girl Alex can’t bring himself to date. As Alex and Katie set their sights on other dates the pair also need to work together to get their gaming team into a big competition. While this one isn’t an overly original story of best friends becoming more it was a fun, quick read. Both Alex and Katie have valid reasons for holding back in the friend zone for so long so it’s nice to see that type of relationship progress to more as they obviously already care. Plus the gaming setting with their group entering a tournament was also fun to follow and root them on. Definitely a cute story I’d recommend to the young adult fans.